In reviewing the history of the 111 Pegasus Squadron it is important to note that although we were the first RCAF affiliated Air Cadet Squadron in Canada and we are very proud of the role we played in the development of the Air Cadet program, the Air Cadet history, as with most things in life, is not a clear and straight line development process. At around the same time as the Air Advisory Council was forming the initial plans for the new Air Cadet Program, there was an organization in Winnipeg operated by a member of the local Lions Club designed to get boys off the street. This program called itself Christ Church Air Cadets and was not affiliated with the RCAF; however, it used the interest young boys have in flight as a tool to get them off the street and interested in citizenship. Later in 1939 this group changed its name to Winnipeg Air Cadets. Around the same time Group Captain Bonham-Carter became interested in the program and provided officers from the RCAF to assist in the training. This Squadron, now known as 6 Jim Whitecross Royal Canadian Air Cadet Squadron, was chartered to the Air Cadet League of Canada as #6 (Winnipeg) Squadron in 1941. Although we do not know the exact timing, it was in the fall of 1938 that the Air Advisory Council was considering establishing an Air Cadet unit to act as a test for a potential national program. Wing Commander Alan Duncan Bell-Irving was a member of the Council and was such a passionate advocate of the Air Cadet idea that Vancouver was selected for the trial. On January 12 1939, Bell-Irving recorded in his diary that he had the “brainwave that Carter should lead [the] air cadet squadron.” On January 13, 1939 he wrote that he “got Nick Carter to accept job as OC Cadet Unit. GO Johnson agreeable.” With those two diary entries, the new Air Cadet Squadron in Vancouver had an OC and approval from Group Captain George Owen Johnson CB, MB the Commanding Officer of RCAF Western Air Command to move ahead. The next step was to start recruiting new cadets. 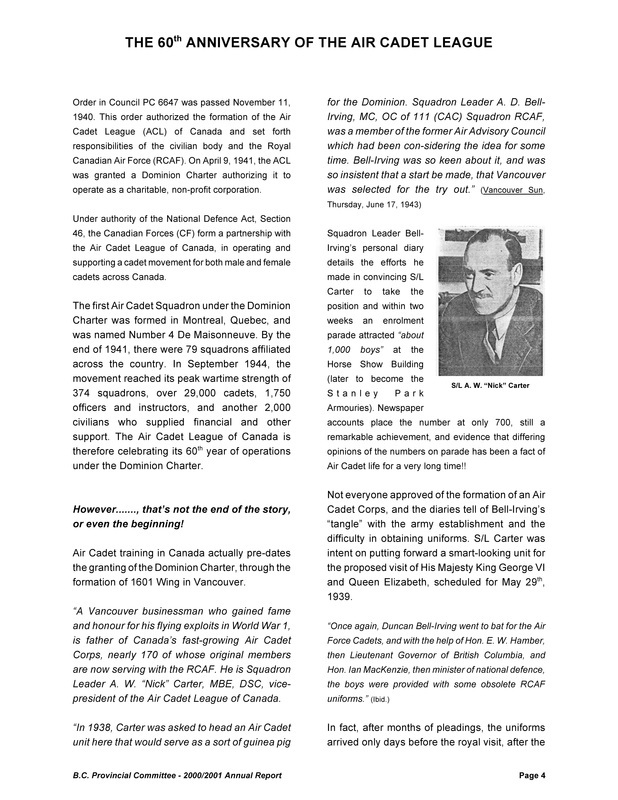 News stories ran in mid-January 1939 in the Vancouver News-Herald, Vancouver Sun and Vancouver Daily Province about the new Squadron. All of those articles invited interested young men over 14 and under 18 to register at the Stanley Park Armouries on Tuesday nights when the 111 RCAF Squadron was meeting at that location. The new Cadet Squadron would be the third Squadron in wing No. 100, which was commanded by Wing Commander Bell-Irving. This non-permanent Wing fell under Western Air Command and Group Captain Johnson. Notes from the diary of Alan Duncan Bell-Irving show the genesis of the 111 Pegasus Squadron in January 1939. January 24 1939 was the first Tuesday for new cadets to join the program. There are varying reports about how many cadets showed up that first night with reports as high as 1,100; however, according to Bell-Irving’s Diary entry on January 25 a total of 1,000 young men showed up to join the new Squadron that first night. According to a news story in the Vancouver Sun on February 1, 1939, the new cadets fell in for their first parade on January 31 and final selections were made for the 150 new cadets. These cadets began their training and preparation for their first official role during the visit of King George VI and Queen Elizabeth May 29 and 31. In order to participate during the Royal Visit the new cadets needed uniforms. With the assistance of the Lieutenant Governor of BC the Honourable E.W. Hamber, the Minster of National Defense the Honourable Ian Mackenzie and Wing Commander Bell-Irving some obsolete RCAF Uniforms were found and issued to the cadets. During the Royal Visit the new cadets performed admirably and received a letter of commendation from Wing Commander Bell-Irving for their efforts. On April 28 1939 the Squadron became affiliated with Cadet Services of Canada and was officially designated #1601 Air Force Cadet Wing. Although the new Cadet Squadron was referred to as an “Air Force Cadet Wing”, it is not clear whether at formation it operated as a Squadron or as a wing composed of multiple Squadrons; however, according to the Vancouver Sun, by April 13 1940 the 1601 Wing had over 200 cadets and was organized into a true Wing with three Squadrons each led by a cadet Squadron Leader. 1601 Wing remained affiliated with Cadet Services of Canada, which later became the Army Cadet League of Canada, for equipment and support purposes until April 1942 although training continued to be provided by volunteers from the RCAF. Therefore, it is significant to note that in addition to our history with the Air Cadet League of Canada, we also owe a debt in our development to the Army Cadet League of Canada. Most of the original cadets of 1601 Wing served in the RCAF. Four of them won Distinguished Flying Crosses and one a posthumous George Cross. By September 1940 the 1601 Wing had 250 cadets and a waitlist of 2,000. In October of 1940 the Wing established a new band. The plan was for a 45 piece band to be organized by Arthur Delamont who was the director of the Kitsilano Boys Band. On October 2, 1940 a story about this new band ran in the Vancouver Sun inviting interested musicians to report, with their instruments, on the following Saturday to try out. The Boys who joined the band were given the rank of cadet and the opportunity to receive RCAF training in their spare time if they desired it. Also in 1940, the Minister of National Defence for Air, Charles G. Power, called in a group of influential civilians to set up a country-wide organization to sponsor and develop the new Air Cadet movement. Among those civilians was our very own OC Nick Carter. On November 19, 1940, Order-in-Council PC 6647 authorized the organization of Air Cadet Corps and on April 9, 1941, the Secretary of State of Canada by Letters Patent officially granted a Charter establishing the Air Cadet League of Canada and authorizing it to operate as a charitable non-profit organization. The first Air Cadet Squadron chartered to this newly formed League was 1 West Montreal Squadron on September 24, 1941. 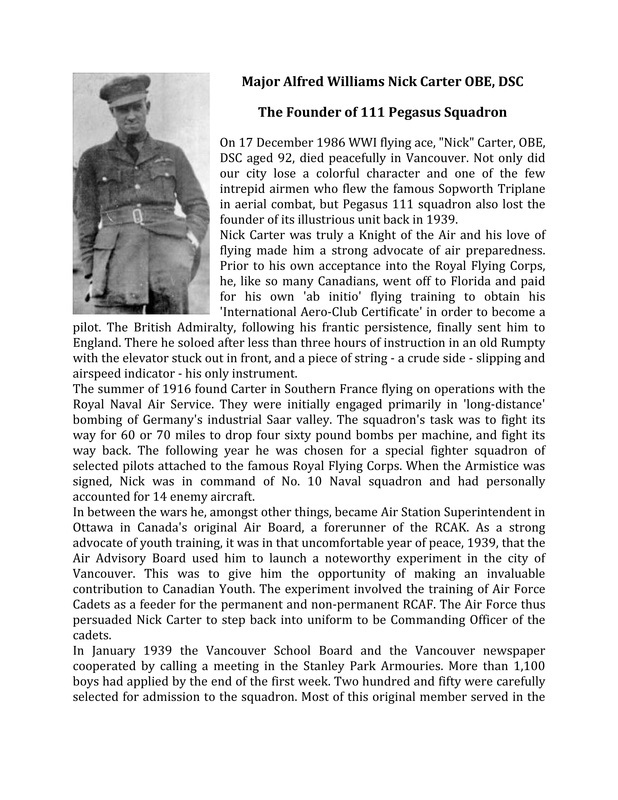 Therefore, although 111 Pegasus was the first Air Cadet Squadron established in Canada, we were not the first to be affiliated with the Air Cadet League of Canada. After the formation of the Air Cadet League new Squadrons were established around the country in conjunction with High Schools and Air Cadet registration grew at a rapid rate. Through the first two years after the creation of the League, 1601 Wing continued to operate separate from the High School Cadet program. During these years boys who were part of 1601 Wing were also allowed to join their High School Squadron but the stipulation of joining 1601 Wing was that they had to be seriously considering entering the RCAF when they were old enough. 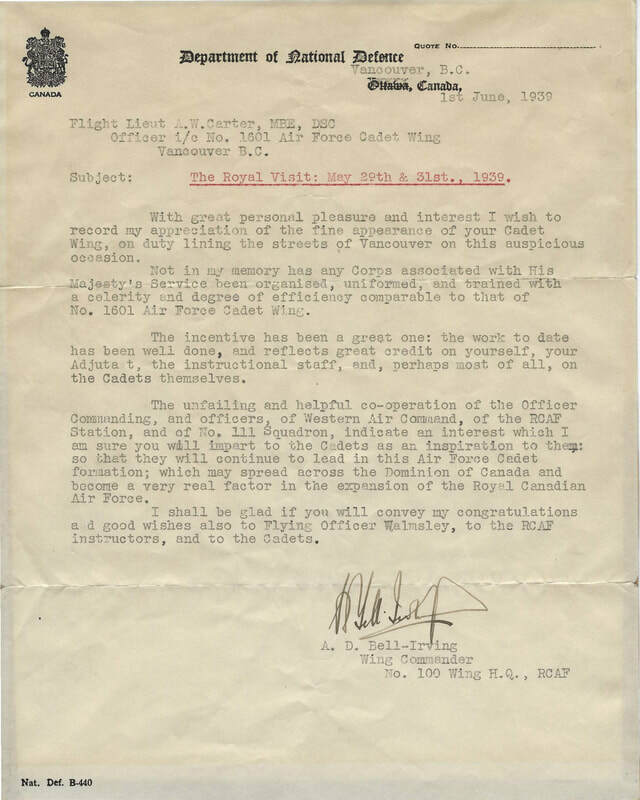 On March 20, 1942 the OIC of 1601 Air Force Cadet Wing wrote to the Air Cadet League and indicated that “because of the impending RCAF administration of Air Cadet Training” they were seeking to transfer the unit to full RCAF control through the ACL. Once again, our initial founders played a significant role in this next stage of our history as then Group Captain Bell-Irving was listed as one of the members of the first Sponsoring Committee and A.W. (Nick) Carter was the ACL Director from BC who certified our application. 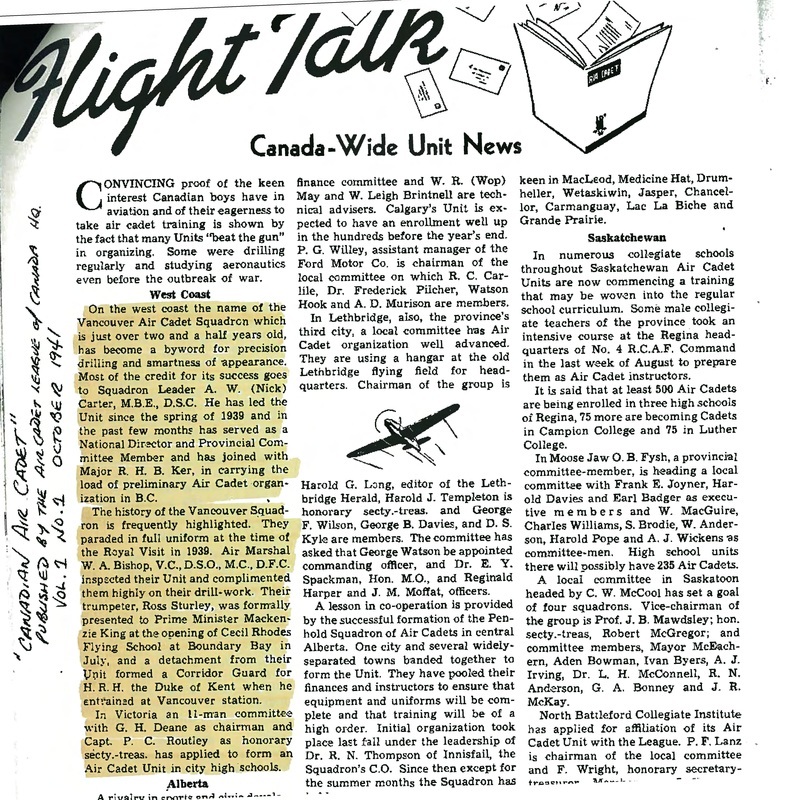 On April 23, 1942 the Air Cadet League wrote to the Squadron advising the new Squadron has been accepted into the Air Cadet League as 111 (Vancouver) Squadron. On April 20, 1942, in what must have been one of the final activities under the 1601 Air Force Cadet Wing name, the cadets were inspected by the Earle of Athlone, the Governor General of Canada. In 1942 when we were chartered to the Air Cadet League of Canada females were not permitted to join the Cadet program and 111 Vancouver Squadron continued to be an all male Squadron. In February 1943 the BC Government permitted the establishment of a Girls’ Cadet Corp in BC Schools which appears to have also occurred in some other Provinces at around the same time. These new corps were in addition to the Navy, Army and Air Force cadets that already operated for boys in the schools and were not integrated with any of the existing groups. In 1949 the 111 (Vancouver) Squadron formed an unofficial all female Squadron named 5 Squadron. Thus, in addition to being the first Air Cadet Squadron in Canada, we were also the first Squadron to permit female cadets. At around that same time, a number of other Squadrons across the country established unofficial female Squadrons and, although not officially recognized by the Air Cadet Program until 1975, competitions were held amongst the various female Squadrons and some female cadets even went on to earn their wings through the program. As early as 1955 the unofficial female squadrons competed in Drill Team Competitions and we have photographs of the 1962 5 Squadron Drill Team in uniform with their trophy for winning the Clarke Rosebowl. We also have a photograph of F/S Donna Jones receiving her wings – although this photo is undated F/S Jones was the Captain of the 1962 5 Squadron Drill Team which establishes that she must have received her wings around that time. Throughout the early years as both 1601 Air Force Cadet Wing and 111 Vancouver Squadron this Squadron paraded out of the Stanley Park Armouries on West Georgia Street at Gilford. In the 1950’s 111 and 5 Squadrons, along with 57, 59, and 135 Squadrons moved to RCAF Kitsilano where the HR McMillan Space Center and Vancouver Maritime Museum are located today and paraded out of No 2 Supply Depot. Together these Squadrons formed No. 1 Wing Royal Canadian Air Cadets and although they continued to operate as independent Squadrons they participated in a number of activities together. These Squadrons all paraded out of No. 2 Supply Depot until the end of the 1963-64 training year when, with the unification of the Armed Forces, a number of bases became redundant and RCAF Kitsilano was closed and sold to the City of Vancouver. Prior to the start of the 1964-65 training year No. 1 Wing was disbanded and 111 and 5 Squadrons both moved to Bessborough Armoury, the home of the 15th Field Artillery Regiment, which remains our home to this day. We continue to be grateful to the 15th Field Artillery Regiment for the use of their space and all of the assistance they continue to provide to our Squadron. At the same time, 135 Squadron moved to the Seaforth Armoury which continues to be their home under their current name 135 Bell-Irving Squadron. 57 and 59 Squadrons amalgamated to form 753 Squadron and moved to the Beatty Street Armoury. Unfortunately 753 Squadron was relatively short lived as on September 1 1972 753 Squadron merged with 111 Squadron. By the early 1970’s there was a push to include Female cadets as part of the official cadet program. Mrs Muffet McGowan who was part of the 89 Pacific Squadron Sponsoring Committee started the formal push with a November 20, 1970 letter to the Ministry of Defense. The campaign continued through 5 years and 3 different Ministers of Defense until finally on July 30, 1975 Bill C-16 received Royal Assent and females were finally fully integrated into the Royal Canadian Air Cadet Program. With this change in law, 5 Squadron officially combined with 111 Squadron to create the fully integrated 111 Pegasus Squadron that exists today. As we celebrate 80 years of providing training to Air Cadets in Canada this year we also celebrate our 77th year of affiliation with the Air Cadet League of Canada and we thank both the Air Cadet League and the Department of National Defense, through the Regional Cadet Support Unit, for their ongoing support and assistance to the excellent program we offer. The Squadron along with the Air Cadet Program in general continues to develop and grow the leaders of tomorrow. Air Commodore Alan Duncan Bell-Irving, MC, OC was a distinguished pilot in the RCAF during the First World War. He was injured in 1916 and removed from combat flight but continued his military career in other assignments. In 1939 he held the rank of Wing Commander and was the commander of wing No. 100 which consisted of No 111 Coastal Artillery Cooperation Squadron in Vancouver, the non-permanent Squadron in Calgary and, starting in 1939, the 1601 Air Force Cadet Wing. After the second world war he retired from the military with the rank of Air Commodore and went into the real estate business in Vancouver. Our first OC, Flight Lieutenant Alfred Williams “Nick” Carter, MBE, DSC was a distinguished pilot in the RAF during the First World War. He received the Naval Distinguished Service Cross in 1917 and the Member of the Order of the British Empire in 1919. Following the first world war he performed civilian functions for the Government of Canada for a number of years and eventually retired from civil service in 1923. After leaving the civil service, he moved to Victoria BC where he founded A.W. Carter Ltd Automobile Dealers. His love of flight never left him and in 1928 he organized the Victoria, BC Flying Club and became their first President. By January 1939 he had been confirmed as the first OC at what would become the 1601 Air Force Cadet Wing. Later he would be part of the group of people who worked to start the Air Cadet League of Canada, the civilian body which to this day continues to partner with the DND for the Air Cadet Program. In July 1946 Nick Carter received the Officer of the Order of the British Empire based on his initiative in organizing the Air Cadet League of Canada.